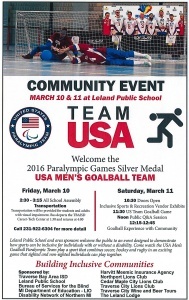 We’re thrilled to be a partner with Disability Networks on a Goalball competition in Leland Saturday, March 11. Click on the flier to the left for all the information. Don’t know what Goalball is? Watch this video from the Rio Paralympics Games. Goal ball is a team sport designed for visually impaired and blind athletes. It was started after World War II to assist in the rehabilitation of visually impaired veterans. The sports is a combination of soccer, hockey and rugby — and very exciting. Doors open at 10:30 a.m. at the Leland Public School, 200 Grand Ave. There will be inclusive sports and recreative vendor exhibits. The game starts at 11:30 a.m. and players will hold a Q&A session afterwards. Then, at 12:15 p.m., join us for a Goalball Experience with the Community. See you there!